Heat large skillet over medium heat, add butter. When butter has melted, saute garlic for 1 minute. Add onion cooking for 2-3 minutes. Stir in mushrooms and cook until tender. Add the sage and wine stirring until all liquid is gone. Heat water for pasta. Cook about 10 minutes. Pasta should be cooked to just under al dente. Drain pasta, rinse under cold water, drain again and set aside. While pasta is cooking heat 1 tablespoon butter in small saucepan over low heat. Whisk in flour until smooth. Slowly pour in milk while whisking. Increase heat to medium cooking sauce until it begins to thicken. Stir in cheese. Coat baking dish with cooking spray. Fill each shell with a spoonful of mushroom mixture. 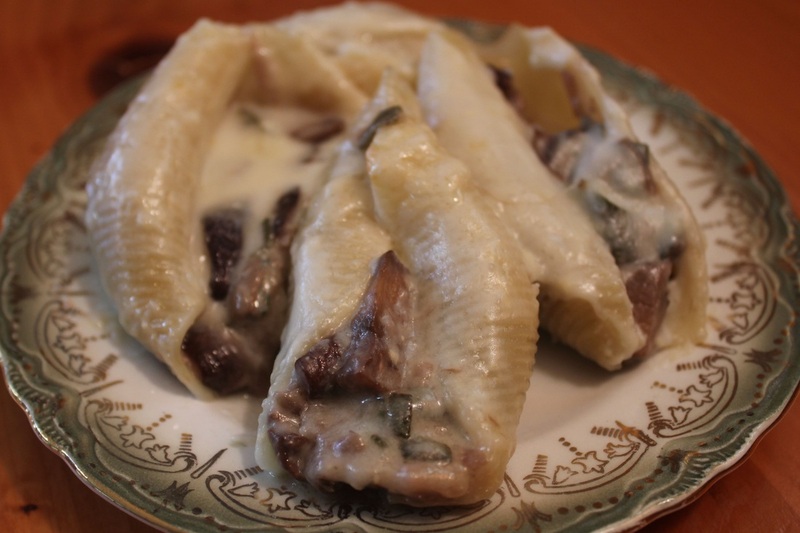 Arrange shells in baking dish, spoon sauce on top of each shell covering well. Cover with foil and bake 20-30 minutes.